You deserve a Christmas Bonus! Order your VGH Millionaire Lottery tickets today, and you’ll be in to win a $40,000 bonus draw – choose the Travel, or take $33,000 tax-free Cash and spend it, save it, invest it how you wish. Copyright © 2018 Millionaire Lottery, All rights reserved. Chances are 1 in 299,000 (total tickets for sale) to win a Grand Prize. Chances are 1 in 482,000 (total tickets for sale) to win the 50/50 PLUS™ Prize. 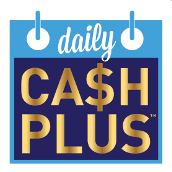 Chances are 1 in 180,000 (total tickets for sale) to win a Daily Cash PLUS™ Prize.